"Enemy bombers are clearly lit up by an inferno on the ground of the urban area. One plane destroyed. I'll keep on attacking." *This was the last message heard from Captain Ogata before he collided with the Z Square 8. Capt. Ogata was from a wealthy, elitist family and attended Military School. According to my Japanese friends, he definitely would have been a career military officer. He was from Kumamoto Prefecture on the southwest part of the island of Kyushu, southwest of Japan proper and 50 miles west of Hiroshima. It is a beautiful land and home to the Aso Caldera volcano, as well as Kumamoto Castle. After WWII, the people of Japan had lost everything, including the Ogata family. Capt. Ogata's wife and baby moved in with his family, and she did whatever work she could to support herself and her daughter and help the Ogata family. Capt. Ogata's wife was able to get to Mt. 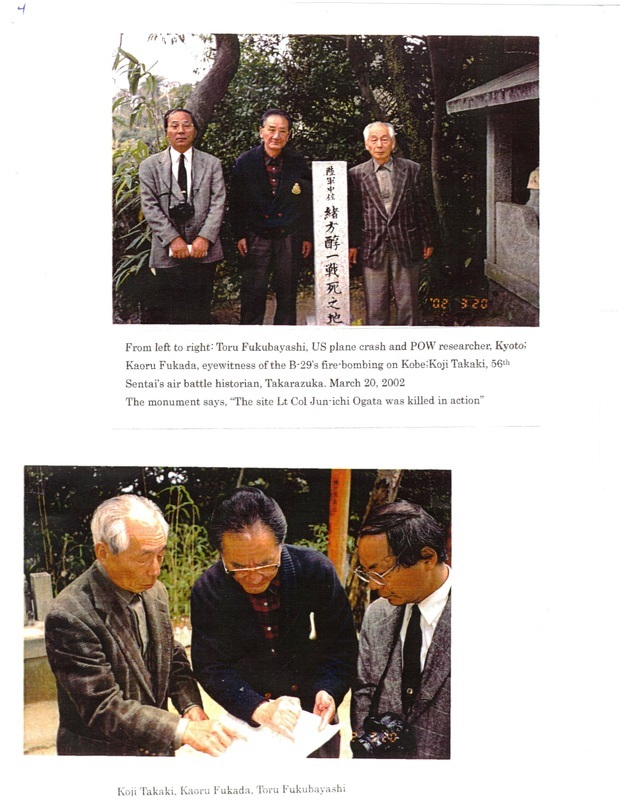 Futatabi for the dedication of his memorial by the 56th Sentai on March 17, 1999. But, she was too frail to climb the mountain to attend the actual dedication ceremony. We wish to thank Tony Holmes and Osprey Printing in London, for giving us permission to use the photographs on Captain Ogata's page. Without their participation, our inclusion of Capt. Ogata's information on our website would have been incomplete. A very special thank you goes to Mr. Henry Sakaida, the author of the book "B-29 Hunters of the JAAF." 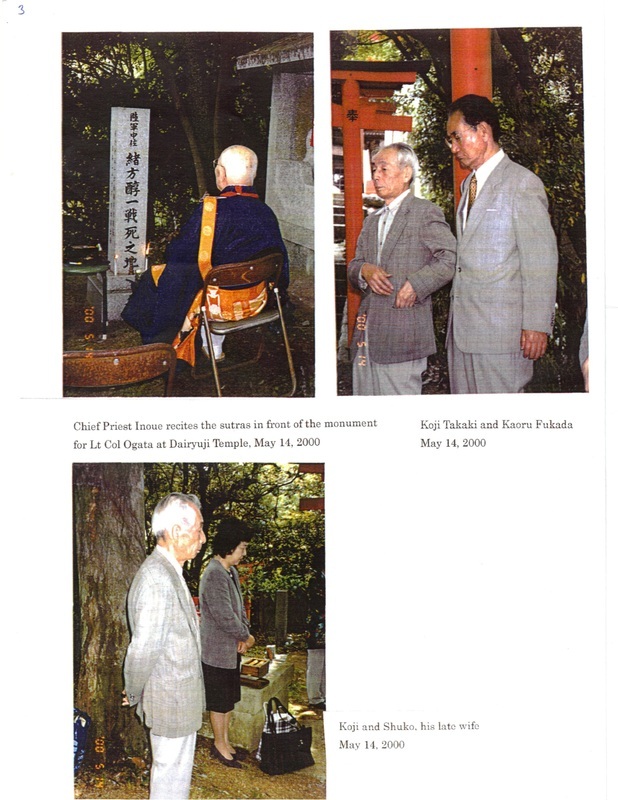 Henry was instrumental in obtaining much Japanese documentation on their defense of their homeland during WWII and putting it in writing. It has been a pleasure to get to know Henry and we are thankful for his participation in our research. Without his research, we would know nothing about Capt. Ogata and his participation during WWII in his defense of Japan. the Z Square 8, "Mission to Albuquerque." Captain Ogata first flew with the 77th Sentai in Burma, where he claimed 8 U.S. bombers shot down. Flying with the 56th Sentai from Itami Field near Osaka, Japan, he was credited with four B-29s shot down and five damaged while serving with the JAAF home defense unit. A respected leader and excellent pilot, Ogata was a fighter defense pilot and NOT a Kamikaze pilot. Kamikaze units were specifically set up by the JAAF in Japan by the 4th Sentai at Ozuki in Western Honshu. A "ramming" by a 56th Sentai pilot was done at his discretion only when dictated by conditions of his aerial combat. In Captain Ogata's case, we cannot determine why he "rammed" our Uncle Bob's B-29, the Z Square 8.
maybe he simply had a mechanical problem with his engine. We do not know, and will not speculate. Captain Ogata was KIA soon after his daughter was born, just like our Uncle Bob. He was posthumously promoted to Lt. Colonel. Capt. 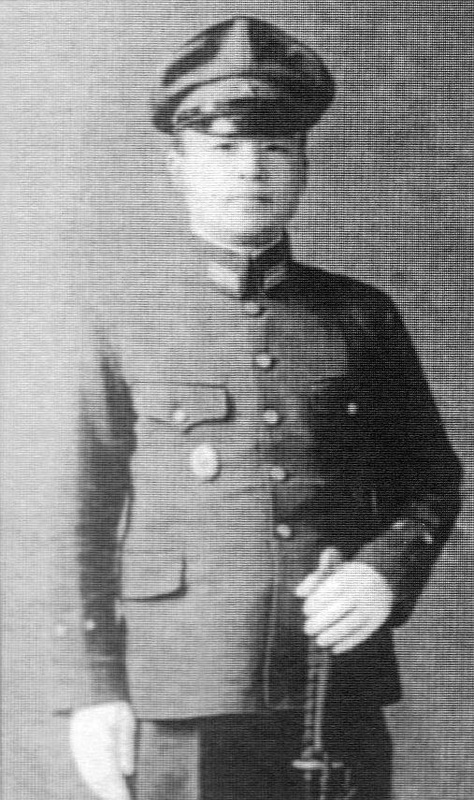 Ogata in full dress military uniform. The following information reinforces my belief that Capt. Ogata did not ram my uncle's B-29 on purpose. In the center of the photograph pointing at the board is Captain Junichi Ogata. Captain Ogata is probably briefing or de-briefing his squadron members about a mission. The captain and his men served with the 56th Sentai at Itami Field in the Hyogo Perfecture near Osaka, Japan, east of Kobe. Fighter pilots of the 56th Sentai based at Itami Field, "scramble" to board their "Tony" fighter planes to confront the onslaught of the B-29s they know are coming. 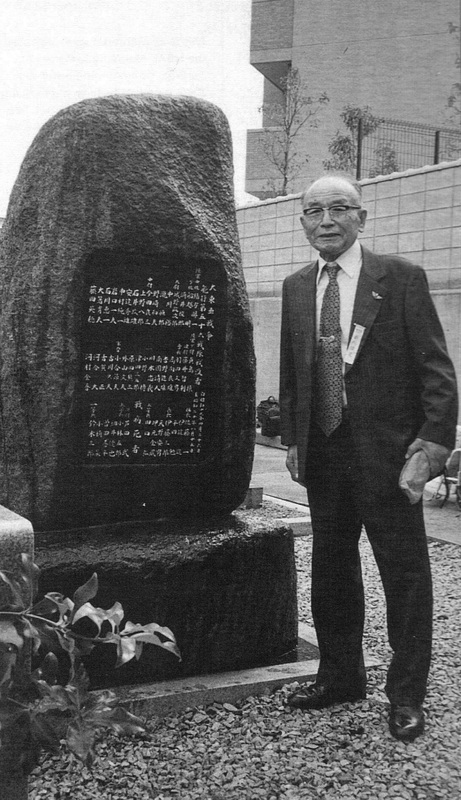 Commander of the 56th Sentai in 1944-45, Haruyoshi Furukawa stands beside the memorial dedicated to the 30 pilots who were KIA in the defense of their homeland. 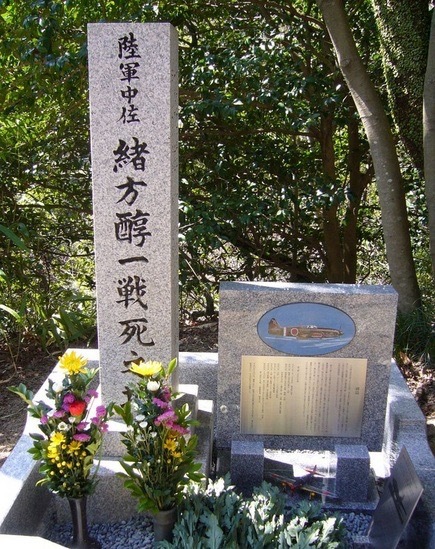 The memorial is located at Chokoj Temple near Itami Field. Japanese records say the 56th Sentai shot down eleven B-29s. 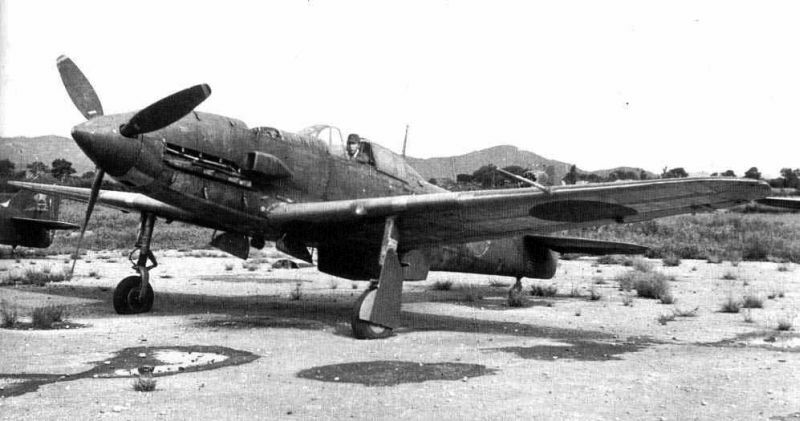 Japanese fighter plane of the 56th Sentai at the Itami airfield in Osaka, Japan. Similar to the aircraft Capt. Ogata was flying the night of his death. Capt. Junichi Ogata in its intercept fight during a big incendiary raid on Kobe on 16/17 March 1945. 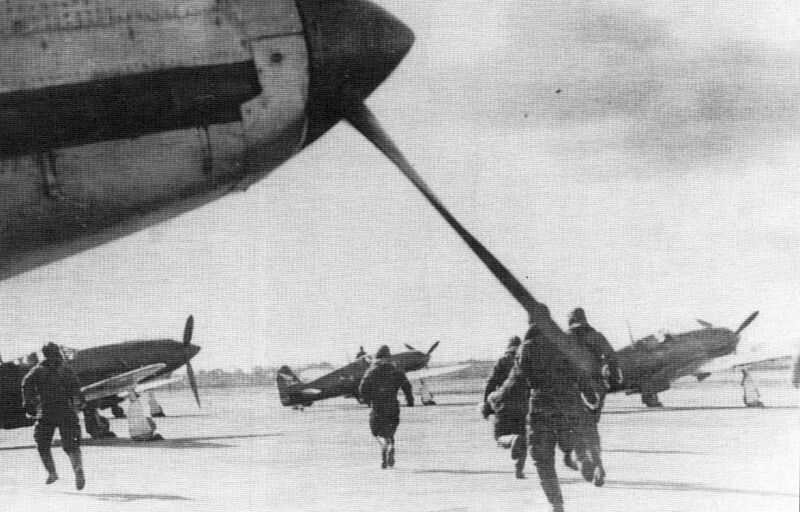 Ogata had been fighting always at the head of the squadron since its first combat against B-29s from Chengtu, China, over the Yellow Sea on 25 October 1944. At dawn on 17 March Capt Nohoru Nagasue's division of four Tony fighters was launched at first. Capt. 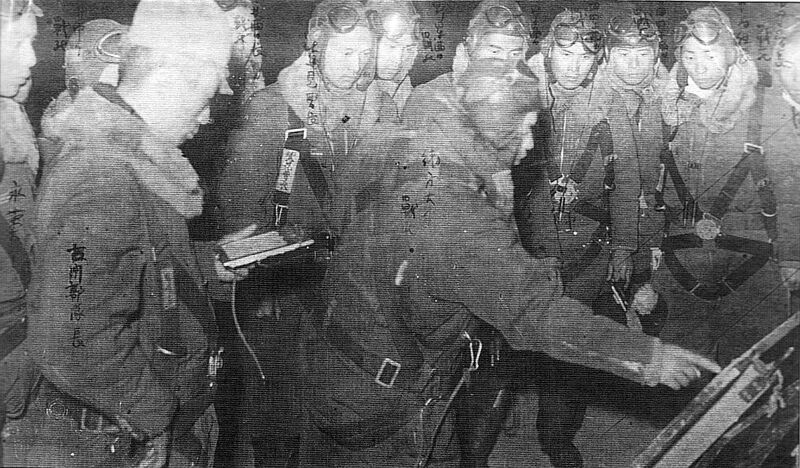 Ogata's division of four planes took off after an interval of 80 minutes to avoid flying in an overlapped air area in the darkness. orbiting over Kobe (located 15 miles southwest of Itami), "Enemy bombers are clearly lit up by an inferno on the ground of the urban areas." In succession, another report came in. "One plane destroyed. I'll keep on attacking." This was the last message. No word was received from him after that. Then, W.O. Kuniyoshi Hasegawa and some of the ground crewmen at the base saw a spot of light streaming like a shooting star into a B-29 that was irradiated by two crossing lights of the searchlights. At the next moment a fireball flamed up. "The roaring flames from Kobe City shot skywards, inviting boiling clouds and strong winds. With the wind blowing from west there was a menacing atmosphere prevailing all over the area." Capt. Ogata who had an early score of 8 bombers destroyed when he was in the 77th Sentai stationed in Burma had already destroyed 4 B-29s and damaged 5 in the home defense air combat. Ogata, born in Kumamoto, Kyushu, 26 at age, a graduate from the 53rd term of Army Air Academy and a brave warrior in the sky, was a superior pilot and leader outstanding both in the mind and skills, had been familiarly respected by all of the members of the squadron. 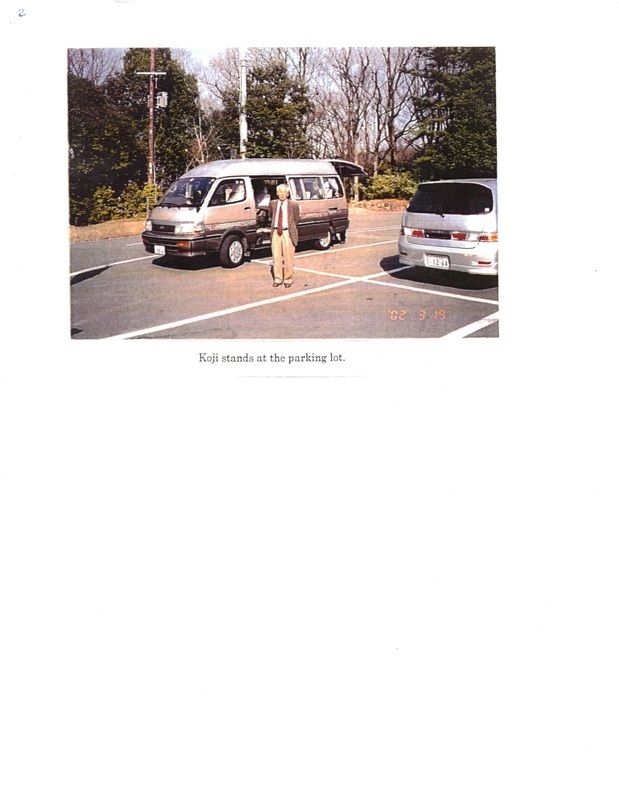 At his home near Itami Airfield there was his baby girl who had just been born. Ogata was the second pilot in the squadron, who rammed down a B-29 after 1/Lt. Toebiro Wakui (AA64) was killed in a ramming at a B-29 over Nagoya on 8 Jan 1945. On the date the 21st BG had just stepped up from precision bombing on the military targets at a high altitude to a first trial of indiscriminate fire bombing on the urban areas by napalm incendiary bombs which would fall like a downpour of rain. Maj. Furukawa recollect, "It was endurable for us in the air only to see the burning cities and frightened people with no means to cope with. This led the flyers to silently determining to risk their lives by using ramming tactics." As for Capt. Ogata, some pilots who were under him say, "We don't think that Captain Ogata rammed intentionally, even if he was determined to risk his life for a near-ramming attack. As it was dark, even a skilled and experienced leader-pilot could collide his target plane by a margin of a split second for his instant manipulation." on 13/14 and Kobe on 16/17 March 1945. Three well trained pilots of the 56th were killed or heavily wounded in accidents at take-off on the nocturnal sorties. MSgt (later W.O.) Tadeo Sumi with over 2000 flying hours, the only ace in the 56th, claimed 4 B-29s destroyed and 3 damaged during his repeated sorties over Osaka on 13/14 March, but he mistook an upper cloud layer for a lower one. He tried to descend towards the upper cloud layer and his plane stalled. He bailed out but was hit by the rudder on his shoulder and heavily wounded. says "one lost on take-off and one missing." Then, it is a riddle which pilot, Sumi or Fujimoto, 246th, downed it. On 16/17 March, it is recorded that 3 B-29s were lost. It may be judged that they were all lost to the ramming of Capt. 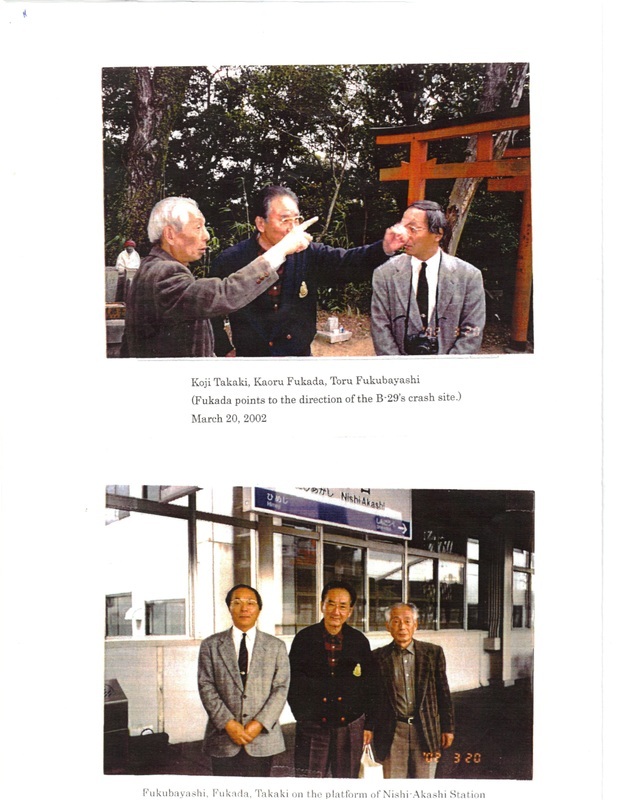 Ogata, MSgt Fujimoto and Sgt. 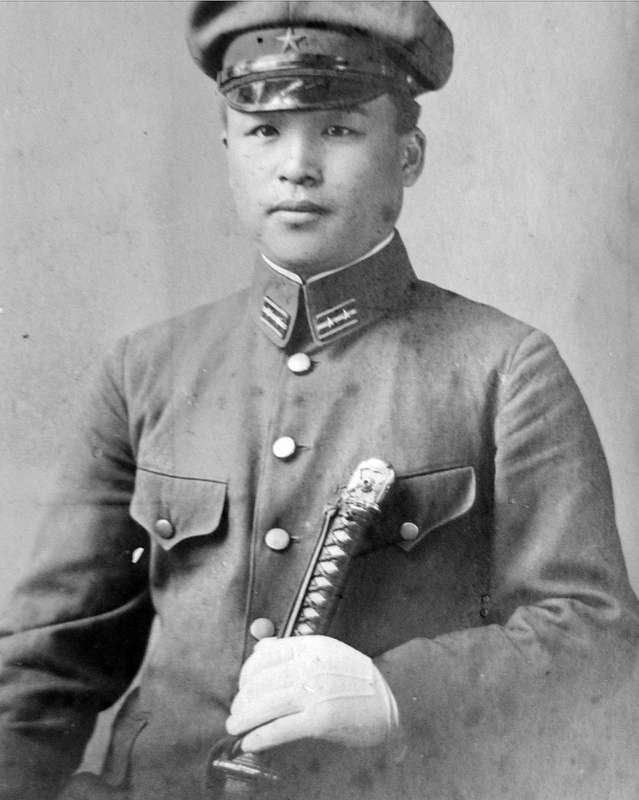 Yukio Ikute of the 248th, though 56th other pilots claimed some planes destroyed. 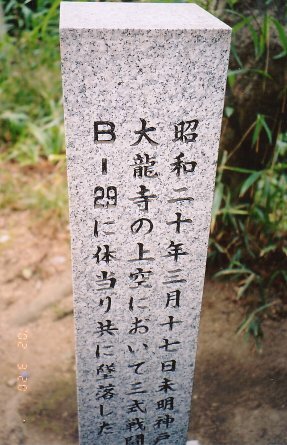 INSCRIPTION READS; "Captain Junishi Ogata was killed near this site on March 17, 1945." INSCRIPTION READS: "Capt. Ogata in an Imperial Army fighter "Tony" rammed into a B-29 on March 17, 1945 over Dairyuji Temple during Kobe bombing. Both went down."